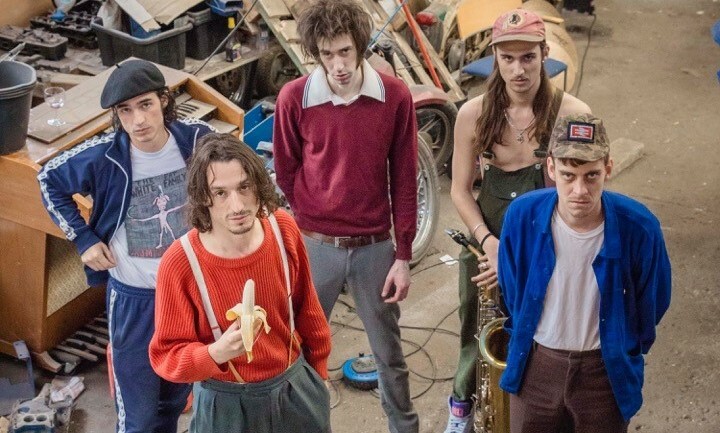 Fat White Family are heading out on a UK tour including a unique record signing session, Getintothis’ Peter Guy licks his lips at the prospect of a messy affair. Fat White Family are to unleash their characteristic noise and chaos on a special in-store signing tour. Having signed to Domino Recordings, the band will bring third album Serf’s Up to various venues across the UK including Liverpool’s Jacaranda Records Phase One on April 24. The band last played Liverpool during Sound City 2015 wearing a provocative The S*n newspaper t-shirt, and having released their second album, Songs For Our Mothers in January 2016, core-members Lias and Nathan Saoudi are back with co-conspirator Saul Adamczewski. The new album was recorded at their own Champzone studios in the Attercliffe area of Sheffield, Serfs Up! was finished in late autumn 2018 with the help of long-time collaborator, Liam D. May and features a guest appearance from Baxter Dury on Tastes Good With The Money. The full tour dates are below with Serfs Up! released on April 19. In celebration of the epoch defining new album, we will be touring the countries finest independent record emporiums on release week playing baroque re-imaginings of our back catalogue 'Serfs Up!'. Praise Allah. Long Live Algeria.